Every day I read a section of Old Testament, Psalms, Proverbs, and New Testament – respectively. 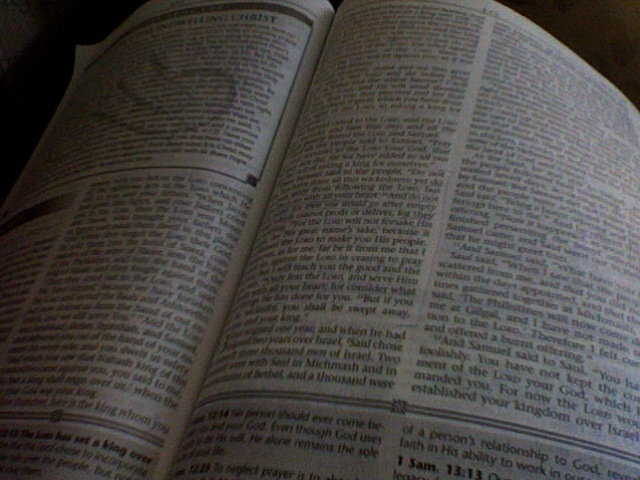 My reading today was in I Samuel 12-13, Psalms 56:1-13, Proverbs 15:21-23, and Luke 47-71. After Samuel pointed out that the people of Israel were wrong for asking for a king, they recognized their sins and wanted to make peace with God. The People were again reminded to not turn away from the Lord, but to serve him only. Don’t follow or pursue after the things in this world (all things in this world are empty). The Lord has chosen us to be His people, for His purpose and glory (His name’s sake). The Lord will not give up on His children! I, like Samuel, will not choose to sin against the Lord by ceasing to pray for you, our family and friends. The only thing we truly need to concern ourselves with is fearing (following, listening to, obeying) the Lord and serving Him faithfully with all our hearts. BUT (in contrast) if (conditional) we do not follow the Lord, we will be “swept away”. And we see throughout history that the Lord is faithful to His promise. The vows, covenants, or promises we make with God are binding. God is always faithful on His end of the promise. We must take seriously our duty and commitment to Him and serve Him only – not just externally, but internally. For if we are truly love only God in our heart, it will be manifested in every other facet of our lives. Psalms 56:11-13: in God I trust; I shall not be afraid. What can man do to me? 12 I must perform my vows to you, O God; I will render thank offerings to you. 13 For you have delivered my soul from death, yes, my feet from falling, that I may walk before God in the light of life. This entry was posted in Daily Reading and tagged I Sam 12, I Sam 13, Ps 56, serve God.